THERE were plenty of smiles and a few tears shed as more than 300 former Austoft employees packed into the Brothers Sports Club for an emotional 10-year reunion. The significance of the day was not lost on those who attended the reunion on Saturday afternoon as it was almost 10 years to the day when the sugar cane harvest manufacturer shut its doors. 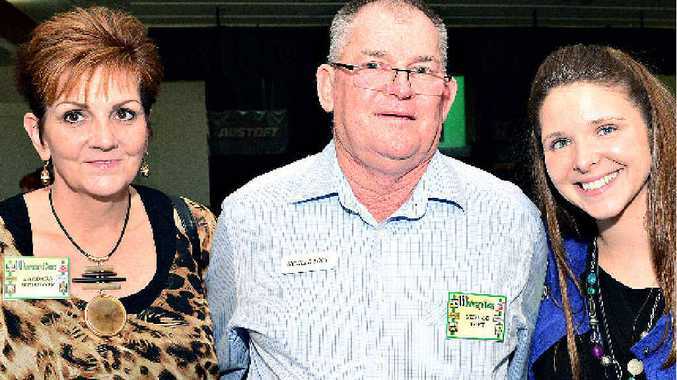 Former plant manager Les Lester said 320 former employees made the trip to Bundaberg and spent the afternoon reminiscing about their time in the city renowned for its sugarcane exports. "It was a fascinating day and a real buzz," Mr Lester said. "We had many people that had left the company many years ago. "It was great to catch up with people that I hadn't seen in 10 years but in many cases close to 20 years." Mr Lester said many people reflected on their time with the company with a great sense of pride. "Most of the people that worked for Austoft stayed with company for decades," he said. "It was a big part of their lives. "We had one gentleman with us who had left the company 40 years ago." Mr Lester said Joyce Toft, wife of Colin Toft - one of the founders of the company - made the trip up for the event. "We made a floral presentation to her and she was quite touched by that," he said. He said Austoft was born out of the Toft family's farm shed business during the Second World War, making contraptions to mechanise the harvesting of sugar cane. Mr Lester said the company had been a leader in its field. "The company was so innovative in its marketing, selling to over 40 countries. "A third of our workforce travelled overseas introducing the product to different customers around the world. "People talked about their experiences in Iran, Cuba, Mexico and Costa Rica." Mr Lester said given the success of the reunion another could take place in 2019.